Manners matter, especially in professional life. The single best way to keep your career network strong and growing is to be polite. Treat people as you'd like to be treated. 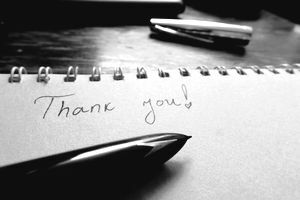 People like to know they are appreciated, and even a quick email message to thank them will help cement your relationship with your reference writer, and perhaps will make them even more willing to help you again in the future. Say "thank you" when someone helps you out. Nowhere is this more important than when someone has done you a favor, for example by writing you a professional or personal letter of reference. Writing reference letters takes time and energy, and most of us have precious little of either. A contact who makes an effort to write you a reference is moving you ahead of several priorities on a crowded to-do list. It's important that you acknowledge that, and thank them for taking the trouble. In doing so, you're not only making your mom proud that she taught you how to behave all those years ago; you're also solidifying a connection with someone who's already shown that he or she is willing to go to some effort on your behalf. That's good business, as well as good manners. The good news is that these thank-you letters don't require much investment on your part – certainly not compared with the reference letter they're intended to acknowledge. Often, you can send your thank-you via email, and take advantage of technology's speedy turn-around time and save yourself a stamp in the process. A clear subject line, mentioning the referral specifically. An acknowledgment of the importance of the referral, e.g., "I know your good word went a long way toward getting me the job." All the standard parts of a business-letter email, including a salutation and a closing. Accurately spelled, grammatically correct writing. Pay special attention to spellings of proper names. A thank-you that misspells the recipient's name feels considerably less genuine. The letter of reference was also written on paper and in ink. It was a reference for a job, and your industry is somewhat traditional. The person doing the referring tends to send physical thank-you notes. Even in this case, email can be useful. However – it's perfectly OK to send a quick acknowledgment of your appreciation via email and then a formal letter afterward. You'll hardly ever go wrong by taking that extra step. In an era when most of us pay our bills online and send out party invitations over email, an actual note can say a lot about your appreciation. It'll also stand out in the recipient's mind as something special. Here are some sample email messages saying thank you for a reference. The 1st sample also informs the reference writer that the person was hired. I really appreciate the reference you gave to the Happy Town Group Home. Jody Smith called me and let me know that I got the job. Your support means a lot, and I'm sure your confidence in me helped her make the hiring decision so quickly. Thank you so much for the reference you provided me for Antella's Pet Grooming. I had a terrific interview with the owner of the company, and I hope to hear back from them about the job soon. I'm excited about the position, and I very much hope it works out. I appreciate your endorsement and support, and I have no doubt your reference was the main reason I got the interview, and hopefully, the job.